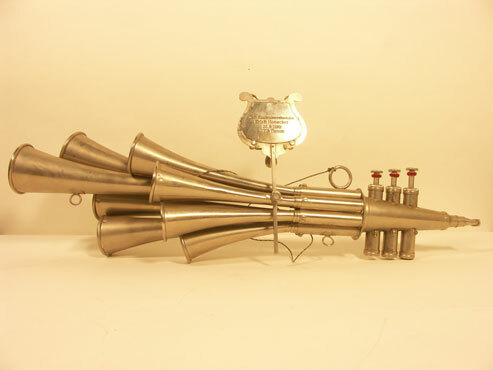 Schalmei (shall-my) was an instrument popular in East German schools, factories and small town brass bands. Easy to learn and play, the Schalmei had been closely associated with the struggles of the German labor movement between the World Wars. Regionally, it is connected with the part of East Germany called Thüringen and with the Saarland in West Germany where Socialist Party leader Erich Honecker grew up. This specimen was actually presented to Honecker by the instrument makers in East Germany in honor of his 75th birthday. Honecker exchanged a Schalmei with West German pop singer Udo Lindenberg for his leather jacket in 1987 in the West German town of Wuppertal.